The San Felasco Tech City (a new community development in Alachua, FL) announces Power Production Management, Inc. (PPM) as the contractor of choice to power the development with renewable solar energy. The solar system is planned in two stages of 500 kilowatts (kW) each, resulting in a 1 megawatt (MW) installation for the initial phase of the development. The San Felasco Tech City (a new community development in Alachua, FL) announces Power Production Management, Inc. (PPM) as the contractor of choice to power the development with renewable solar energy. The solar system is planned in two stages of 500 kilowatts (kW) each, resulting in a 1 megawatt (MW) installation for the initial phase of the development. The electricity generated onsite is projected to completely offset the energy use of the facility, thus making it energy independent. The 1 Megawatt (MW) array is set to produce over 30 million kWh over its useful life. According to the Environmental Protection Agency (EPA), it is the equivalent of 50 million lbs. of CO2 not emitted into the atmosphere. This will equate to powering 2,400 homes or taking 4800 vehicles off the road for one year. “As a solar contractor, I am very excited to see solar power finally being incorporated on a large scale on new construction projects,” said Jason Gonos, Co-Founder of Power Production Management, Inc. 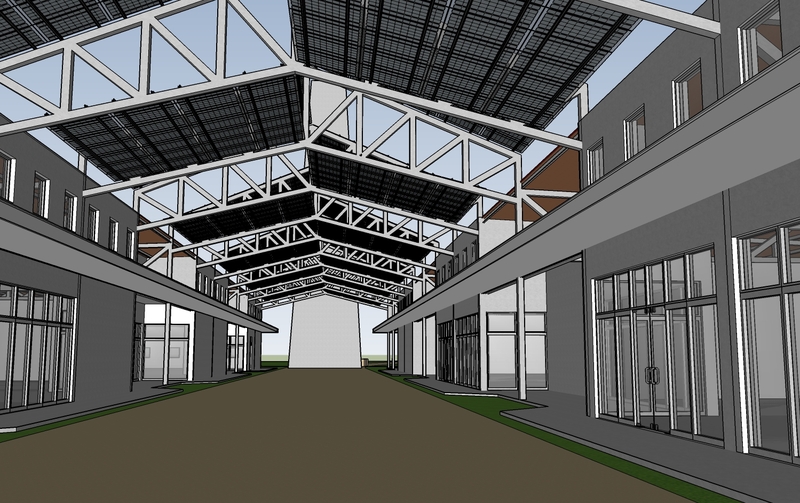 The solar project will feature a 250 kW array to be integrated into the connecting atrium and will provide shaded space, while designed to be translucent. It will also feature a 750 kW rooftop mounted array and solar trees designed by a team led by Martin Gold, Professor at UF’s School of Architecture. “In the process of looking at solar power for the project, we quickly discovered that going with a larger system fit perfectly in with our goals and objectives for the Tech City,” said Rich Blaser, co-founder of Infinite Energy and co-developer of the San Felasco Tech City. About San Felasco Tech City Development: San Felasco Tech City is a 55 acre, unparalleled development project that will provide innovative flexible entrepreneurial space for office, living, and light manufacturing. Phase 1 of the development is to be completed by April 2019. The San Felasco Tech City will feature multiple facilities including office space, a 150 feet tall multi-use observation tower, accessible nature trails and conservation areas, and a multitude of flexible business and living spaces including tiny homes, tree houses and apartments. About Power Production Management: Power Production Management, Inc. (PPM) is a solar contracting firm licensed in multiple states across the Southeastern United States. PPM focuses on providing aesthetically pleasing, high-quality solar projects to the clients across residential, commercial, utility, and institutional market segments. PPM has a vision of the world powered by the Sun. © 2018 Power Production Management, Inc. All Rights Reserved.